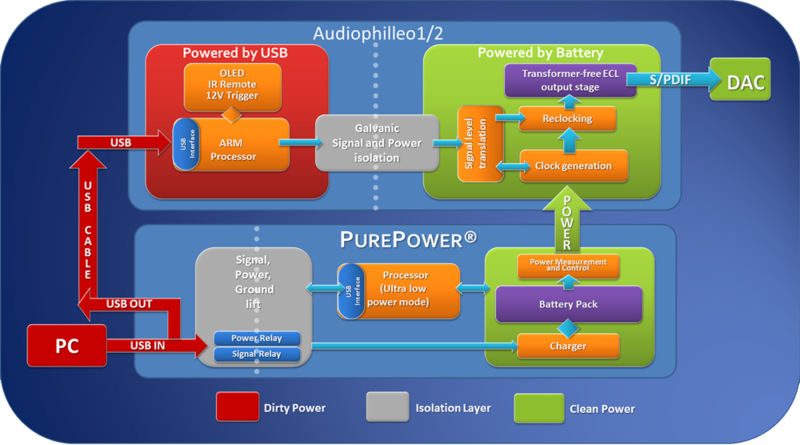 The Audiophilleo PurePower automatically monitors every aspect of its operation, and is constantly evaluating how to present the purest possible power to the Audiophilleo USB transport. The PurePower’s microprocessor detects when the Audiophilleo1 MKII and Audiophilleo2 MKII are playing music and automatically switches into total isolation mode. High-quality miniature relays automatically “open” to physically break the connection between the outside world and the PurePower, which in turn can then deliver highly regulated, ultra-pure “juice” to the Audiophilleo. The relays “lift” the USB data, power and ground connections, thus removing any chance of contamination of the Audiophilleo’s critical clock generation or output stage circuitry with noise coming in over the USB cable. Most other accessory power products—even ones costing two or three times as much as the PurePower—usually require manually removing the power cord from the mains or disconnecting the charger (almost always a noisy “switcher” power supply) for best performance. The PurePower’s unique ergonomic orange and black display shows the power (voltage and current) being supplied to the Audiophilleo, along with how many hours of PurePower are remaining: There’s even a graph of power consumption over time. When the PurePower starts up, its internal microprocessor leads you through integration with the Audiophilleo and incoming USB cable from the music server; once these are connected, PurePower automatically configures itself and is ready to go. You can tailor the performance of the PurePower to your preferences with the joystick and easy-to-use menus on the display. And PurePower firmware can be readily updated in the field, to take advantage of any product improvements and new features. Whenever there’s a pause in the music, the PurePower automatically starts recharging itself—a PurePower exclusive feature. Instead of having to guess when the power is running low, and then fiddling with switches, chargers and power cords, and waiting for the device to charge up, PurePower’s microprocessor automatically manages everything for you. Given the extraordinary capacity of the onboard power cells—enough for over 15 hours of continuous operation—in normal use, your Audiophilleo will always be running on PurePower. During recharging—usually done automatically only when music isn’t playing—the PurePower relays “close”, connecting it to the USB power, data and ground. The USB data signal connection is available to the onboard microprocessor controller for system management and firmware upgrades.